As usual, several shoplights didn’t survive the winter, so I gutted and rebuilt them with LED tubes. 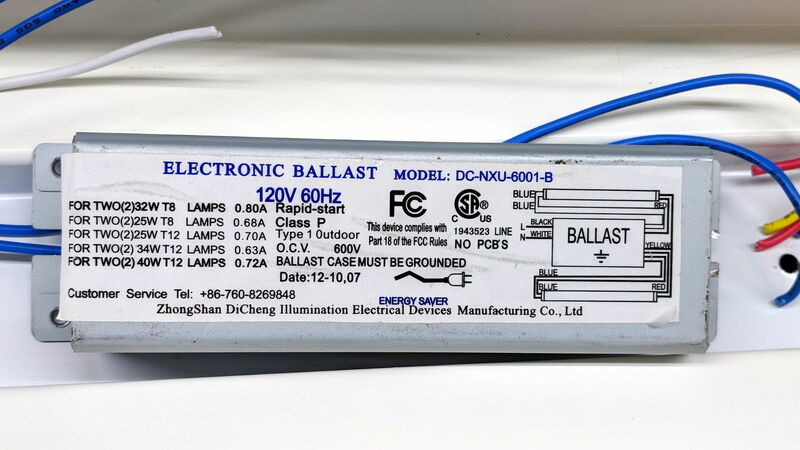 Even the fancy shoplights with genuine electronic ballasts survive less than nine years, as two of those eight “new” lamps have failed so far. The black gunk smells more like plastic and less like old-school tar. It’s definitely not a peel-able conformal coating. If a dying ballast didn’t also kill its fluorescent tube(s), I’d be less annoyed. I’m running the remaining tubes through the surviving fixtures, but the end is nigh for both. The new LED tubes produce more light than the old fluorescents, although I still don’t like their 6500 K “daylight glow” color. 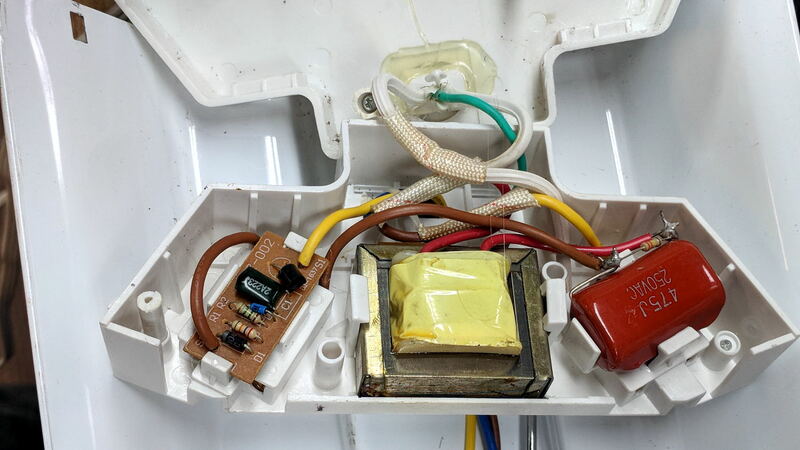 This entry was posted on 2018-04-12, 07:07 and is filed under Electronics Workbench, Home Ec, Machine Shop. You can follow any responses to this entry through RSS 2.0. Both comments and pings are currently closed. I’m seeing 5000K fixtures and bulbs available at ‘Zon. Not sure what I have at home; I’m doing another medical stint–right eye. It’s the last round, so Yeaaah! And you’re seeing, which is not to be taken for granted! 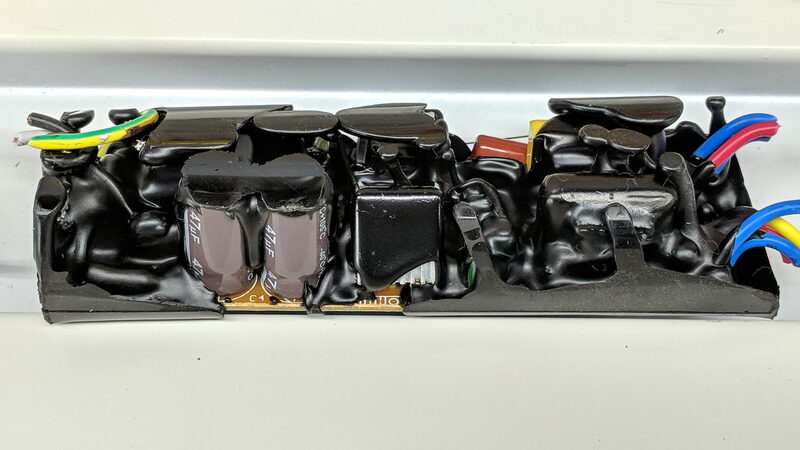 Most of the modern ones I have taken apart have had that same black goop inside–I don’t know what it’s for either, but sound deadening is as good an answer as any. I’ve found LED bulbs in a wide variety of color spectrums. We’ve been going with 4000K, which gives a very clean light. The (rather cryptic) instructions suggest one can snap (some?) 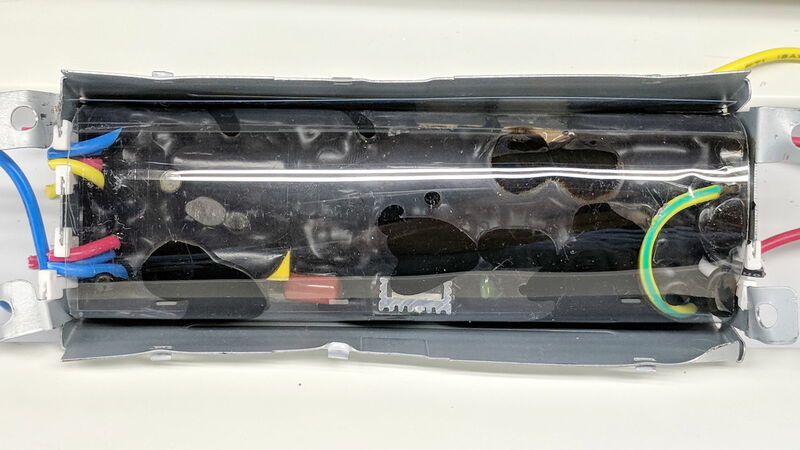 LED tubes into existing fixtures with the ballasts intact, albeit with possible magic smoke emission; I’d rather gut the fixtures and avoid the smoke thing. In your situation, though, rewiring is definitely a Bad Thing! The 4000 K tubes sound like a major win and, for my next basement shop, they’ll be even cheaper and more readily available. If it were me, I would have gone with pulling the ballasts, but the decision was made above my pay grade. On the fixtures that we did rewire to run direct (the 8 foot bulbs) it was cake, we just bypassed the ballast and ran the positive to one end and the negative to the other. We’ve also been doing the exterior lighting direct wire, which makes me very happy. If I never have to wrestle an HID ballast kit up a twenty foot ladder to install it on the outside of a building again I will be a happy man. 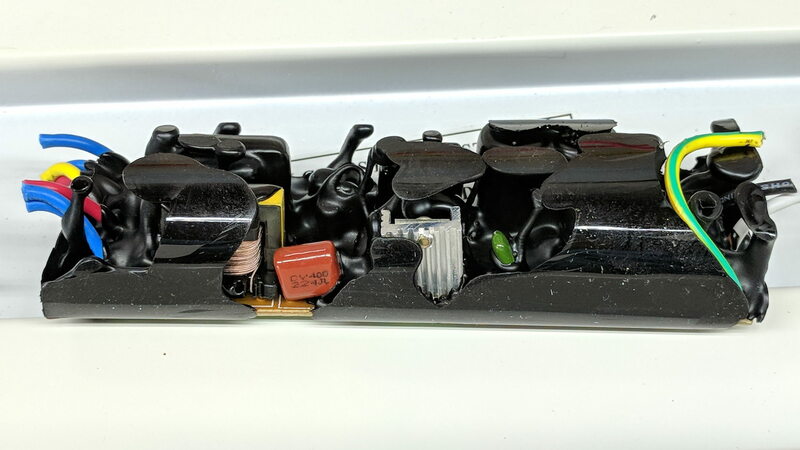 I had to search for LED tubes with Line on one end and Neutral on the other, with four feet in between, because I straight-up did not want both in the same tombstone. Call me a sissy, it’s fine. You had to search for those? Meaning that the standard is what, both hot and neutral in one tombstone? Odd, The only ones I’ve bypassed have been either mogul base screw-ins or 8 foot bulbs with a single pin on each end. Makes your blood run cold just thinking about it, eh? Oh, oh, guess I need to take a close look at that case of LED tubes I have in the round-tuit stack. We have some2700K 7 W bulbs in the house. They’re a bit too yellow for my taste; trying to differentiate a yellow dog biscuit from a beige one can be a pain.